If you've been following us for a while, you know that we have a small love of homemade play dough. (And by small, I mean huge). Not only that, we have a tendency to melt down crayons and create bold, bright, and beautifully soft crayon play dough. We've made metallic sparkly crayon play dough and dough with every shade of red crayon that there is. We've even melted down crayons and made crayon floam dough for a super fun sensory dough. 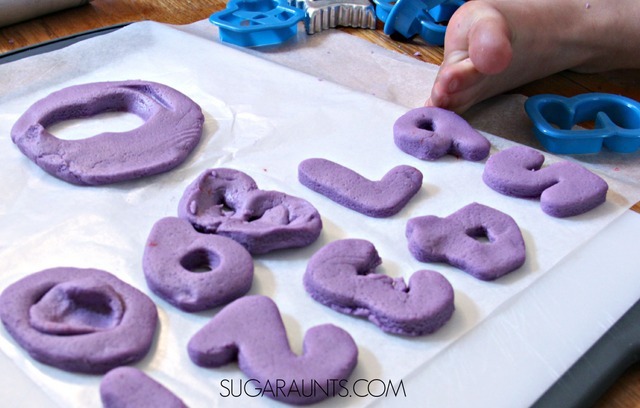 Today, we're sharing our latest crayon experiment: Crayon Salt Dough! 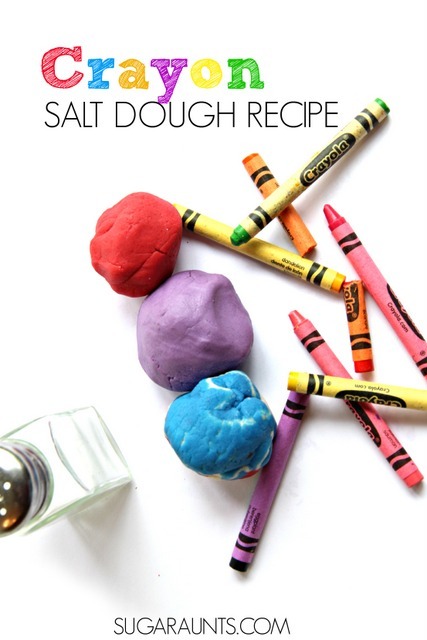 This salt dough recipe is a version of our crayon play dough that is tinted with the wax of crayons, giving it a bright and bold hue. 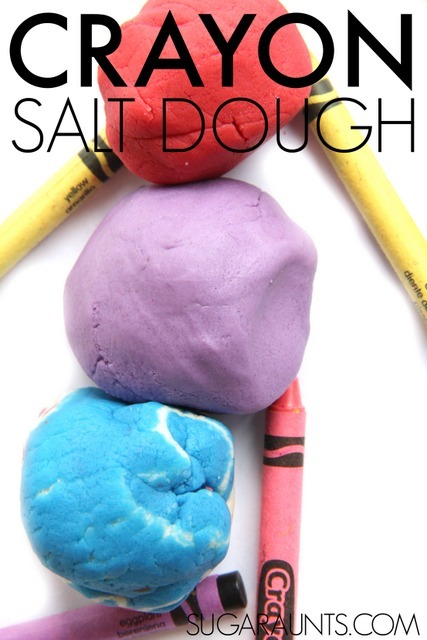 So, HOW do you make salt dough with crayons? Read on! 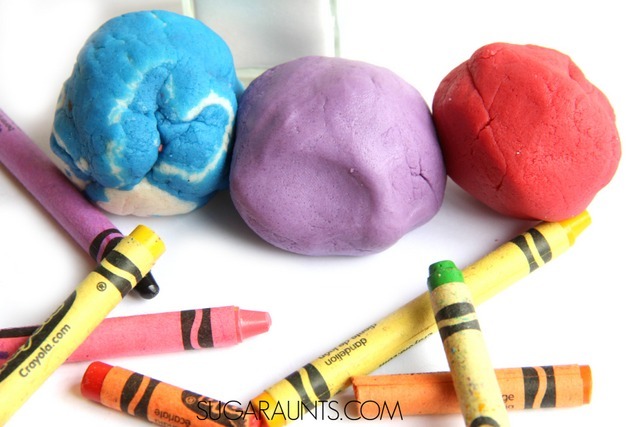 How to make salt dough dyed with bright and bold colors of Crayons? to make our Crayon Salt Dough, we used portions of our crayon play dough technique. I'm including affiliate links for some items you may need to purchase to make this Crayon Salt Dough. 2-3 chopped crayons crayons (This is the tried and true brand that works for all the crayon doughs that we've made.) I say 2-3 because we used broken crayons that have seen their days of coloring book fame gone. In other words, they are the bits and pieces of crayons that are floating around the bottom of the crayon bin. 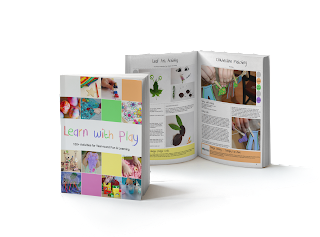 I've found that a difference of 2 or 3 crayons does not matter all that much when it comes to bright and vivid colors you will get from using crayons to dye play dough or salt dough. Now, when we made our salt dough, we made a few different colors. So, instead of using the measurements above, I had the kids measure out all of the ingredients and then divide the dry ingredients into three different bowls. I then made three batches of salt dough. You could do the same to make a few different colors...and with a huge box of gorgeous crayons, you'll probably want a few different bright and beautiful colors. I will describe the instructions on making just one batch of crayon salt dough so that measurements are not confused. Prepare the dry ingredients: Mix together in a bowl, the 1 cup salt and 2 cups flour . Set the dry ingredients aside. Peel the wrapper from and chop up the 2-3 crayons. Pour the 1 teaspoon of vegetable oil into a sauce pan. We found the cheapest sauce pan that we could and use it for all of our kitchen experiments. (i.e. I would not use it for cooking actual food!) Turn on the burner and add the chopped crayon to the oil. Do not let the oil heat up too much! Stir while adding 1 cup of water. Continue stirring and slowly add in the dry mixture. Stir until the dough begins to lump together. Dump out onto parchment paper or other surface. Allow the dough to cool to touch. Knead the dough until smooth. Then knead a little more. If the dough is too sticky, add a bit more flour in 1/4 cup increments. We used our dough to create number manipulatives using number cookie cutters . They are still drying, but we have big plans for these cuties! Be sure to stop back soon to see how we're using them in all kinds of counting and ordering games. We let these cut outs dry for several days on wax paper. I was hesitant to try slow heating them in the oven like a typical salt dough recipe because of the wax content. I like my oven a little too much for that experiment!